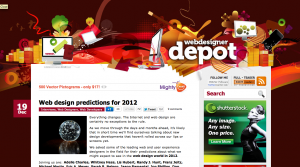 This winter, I was asked by the awesome folks at Web Designer Depot for some predictions about what will happen in the world of web design in 2012. After I told myself to stop be baffled that they asked me, and after I got over the fear of putting my thoughts out there to their wide audience, I was able to come up with a few ideas. You can read them below. Now that HTML5 and CSS3 have been unpackaged and utilized, and given the emergence and popularity of responsive and adaptive web design, 2012 will bring us back to the future of the web. After years of driving the two apart, 2012 is the year that we will begin to bring mobile and desktop technologies back together by using the web to bridge the gap between the contexts. From that, we will be focused on designing for a holistic product experience. Expect to see an explosion of mobile/desktop web solutions that can work on many different devices and platforms. Mobile First as a methodology will grow in popularity, and people will also be thinking more about how their product extends across these many different contexts. Look for an outbreak in designers and product developers wanting to better understand users in order to create appropriate solutions for coherent experiences. We’ll be looking more and more towards psychology and user research to better understand our user base as well as better translate our product into an interface. From this we’ll see the appearance of new ways to navigate through site content (in order to stay responsive), as well as new patterns for creating delightful and engaging user experiences online.